The New York Times and the Russian state news agency Sputnik agree with my new book, Architects of Disaster: The Destruction of Libya, which posits that President Obama's and former Secretary of State Hillary Clinton's signature foreign policy achievement success is an abject failure. Who would have ever thought that the New York Times and a Russian state-controlled media outlet would find common ground on such a controversial subject? Only Clinton – the eternal optimist who orchestrated Muammar Gaddafi's murder and the inevitable Democratic nominee for president – continues to believe in the triumph of the operation. She said in the most recent Democratic debate that "[W]e didn't put a single boot on the ground, and Gaddafi was deposed. The Libyans turned out for one of the most successful, fairest elections that any Arab country has had. They elected moderate leaders." In reality, the chaos and mayhem following the 2011 NATO/U.S. intervention to depose Gaddafi has reached the point where ISIS has established a new base. Sirte – located along Libya's Mediterranean coast – has become an actively managed colony of the central Islamic State. It is crowded with foreign fighters from around the region, especially from its caliphate in the former Syria and Iraq as NATO increases its military and economic pressure there. The new location enables it to generate oil revenue and plan terror attacks only 400 miles southeast of Sicily. How can the West win against ISIS when U.S. leaders refuse to acknowledge that which everyone around them recognizes as a catastrophe? I wrote in Architects of Disaster that the current crisis is the preordained consequence of the administration reversing decades of bipartisan precedent in 2009 when it embraced such bad actors as the Muslim Brotherhood, al-Qaida and Hamas – jihadist organizations with American blood on their hands – with no preconditions. President Barack Obama said in a 2007 interview that he believed that the power of his personality would lead to jihadists laying down their weapons once the U.S. helped them to remove their autocratic leaders. Instead, radical Islamists rushed to fill the vacuums in such places as Egypt, Yemen and Libya. The opportunity for ISIS to move into Libya arose with two forces – a fundamentalist Islamist government based in Tripoli and the internationally recognized parliament in Tobruk – competing with each other for power instead of battling extremist elements. "In Libya, where a NATO bombing campaign helped overthrow Col. Muammar el-Qaddafi four years ago, there is no functional government," the New York Times reports. "Warring factions are far more focused on fighting one another than on taking on the Islamic State, and Libya's neighbors are all too weak or unstable to lead or even host a military intervention." ISIS has now moved many of its operations and personnel to Sirte – having increased its presence from 200 fighters at the start of the year to a force of 5,000 men – including administrators and financiers. They are also learning to fly airplanes with at least one flight simulator. "The group has already announced their plans to recruit foreign fighters, and is calling them to travel to Libya instead of Syria," Sputnik reports. "According to residents and activists from Sirte and Libyan military officials, recent weeks have already seen a flood of foreign recruits and their families." Left unchecked, an ISIS caliphate in Libya – only a boat ride away from southern Europe – could become far worse than the current caliphate in the Middle East. It will also create space for plotting for more attacks like the current onslaught against Israelis, the bombed Russian civilian aircraft in Sinai and the Paris massacre that left 130 innocent men, women and children dead. Pete Hoekstra is the Investigative Project on Terrorism's Shillman Senior Fellow and the former chairman of the House Intelligence Committee. 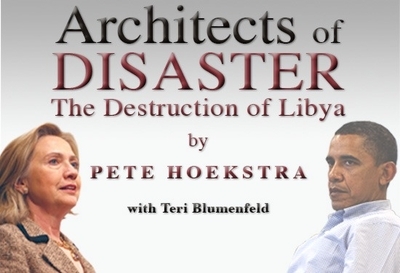 He is the author of "Architects of Disaster: The Destruction of Libya." "In reality, the chaos and mayhem following the 2011 NATO/U.S. intervention to depose Gaddafi has reached the point where ISIS has established a new base." But isn't that exactly why Hilary and Obama claim success? Because this was their intention to achieve something just like this?